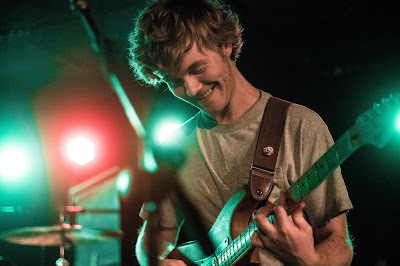 Evan Hall of Pinegrove. Photo by Macey Norvell. Pinegrove brought its folksy indie rock tunes to a crowd consisting almost exclusively of hip college kids on Tuesday night at the Bottleneck. In true millennial fashion, the audience laughed along with onstage banter about Chili's and Twitter and engaged in a fun, upbeat set. Fans sang along to each song and even softly moshed to popular favorites like "Size of the Moon." The opening acts Lomelda and Florist had similar delicate vocals, synths, and guitar plucking. Lomelda is fronted by Pinegrove's bassist, and the audience was wowed by her performance as a lead singer. Both opening acts thanked the audience for its attention; during the quiet moments during songs one could hear a pin drop.